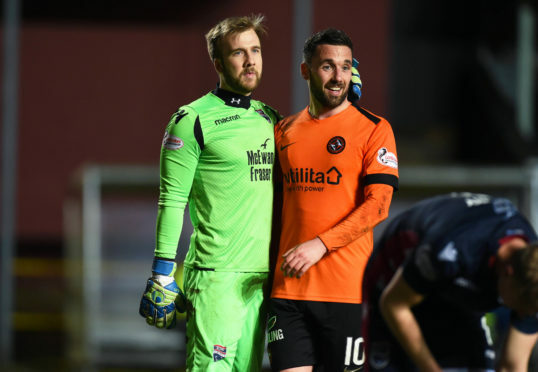 Scott Fox and Nicky Clark during Tuesday's game between County and Dundee United. Goalkeeper Scott Fox rejected any suggestions of County easing off in the Championship run-in. With the Staggies in the IRN-BRU Cup final on Saturday, their nearest challengers for the title, Dundee United, can close the gap to two points before County return to league action, with United having games on Saturday and Tuesday. But Fox would prefer to be in the Staggies’ position, with an eight-point advantage and a cup-final outing. The 1-0 defeat at Tannadice on Tuesday was County’s second defeat by United this season. United face Alloa this weekend before heading to Dunfermline on Tuesday night. Fox, who gained promotion from the second tier with Partick Thistle six years ago, vowed that County will not relent in their bid for an immediate return to the Premiership. He said: “Of course, we would rather be in our position. Tuesday was just a bump in the road. There’s a lot going on and this is the end you want to be at in the league. It’s a bit raw now with the result but we’ll regroup today and get ready for the cup final. “We’re off league duty and Dundee United have work to do. We’ll see how it goes and look forward to Saturday. We wanted to build after last season and we’ve got that winning mentality. “We’re gutted that we’ve lost but need to make it right and win as many games as we can to get out of this league. You don’t want it going to the wire, not when you’re eight points clear. “We’ve got a derby to come and there’s a few big games and we’ll not take our foot off the pedal. Even if we’d won on Tuesday, we wouldn’t have done that. County face United once more before the end of the season, with that fourth encounter at home on April 5.